Low vision rehabilitation refers to a wide range of services provided by eye doctors, rehabilitation therapists, counselors, and government and private agencies. 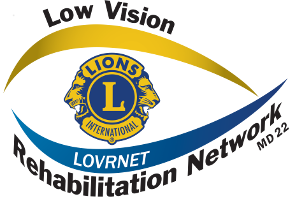 Low vision rehabilitation teaches people with low vision how to cope with the stress and frustrations of visual impairments and how to perform the daily activities they want and need to do in order to live more active, productive, enjoyable, safer, and more independent lives despite their impaired vision. Low vision aids are special tools that play an important role in restoring everyday function to people with low vision. Some low vision aids, like optical and electronic magnifiers, need to be matched to the vision and the requirements of the individual and therefore should be recommended by an eye doctor after a thorough evaluation. Other low vision aids are specialized consumer products that compensate for impaired vision. Some common examples are electronic books and tablets, special software for computers, and cell phone apps that enlarge print to a size that is easier to read by the visually impaired user. A range of special products for people with low vision, called daily living aids, are available in the LOVRNET Low Vision Store..
• Clocks and Watches: There are a variety of men’s and women’s analog and digital watches and wall and alarm clocks that have large high contrast numbers (and hands), many of which talk to tell the user the time when a button is pressed. • Lamps and Lights: For many people with low vision, their vision is dim under normal lighting conditions, but their vision improves simply by increasing the amount of light that falls on what they want to see. So, high intensity task lighting can be very helpful. There is a wide variety of high intensity table, easel, and floor lamps available that are designed to put a lot of light onto a work area to improve the visibility of the task material. • Health and Care: Many people with low vision have other health problems such as diabetes that they have to manage themselves. There are several different self-health care products designed for people with low vision. These include talking glucose monitors, blood pressure monitors, scale, and thermometer; preset syringe fillers for insulin or other injectables; large print and raised letters/braille pill boxes; an eyedrop guide; and nail clippers and tweezers with a built-in magnifier. • Home and Office: Most people with low vision are helped by having products with large print and high contrast. There are special measuring cups with large print markings and are colored either black or white to contrast with what is being measured. There are cutting boards that are black on one side, for cutting and chopping light foods like onions, and white on the other side, for cutting and chopping dark foods like green peppers. There are products like a 17” oven mitt that helps prevent burns and a knife guard to increase safety when cutting. Other large print and high contrast products include cooking timers, telephones, and keyboards. Other useful products include large print universal remote controls with raised letters/braille and raised dots or other marks designed to be put on appliance controls so their settings can be read by touch. • Reading and Writing: There are large print address books, calendars and check registers. There are plastic writing guides for signatures, envelopes, checks, cards, and 8 x 10 paper. To make writing easier there are high contrast marker pens and bold line paper. 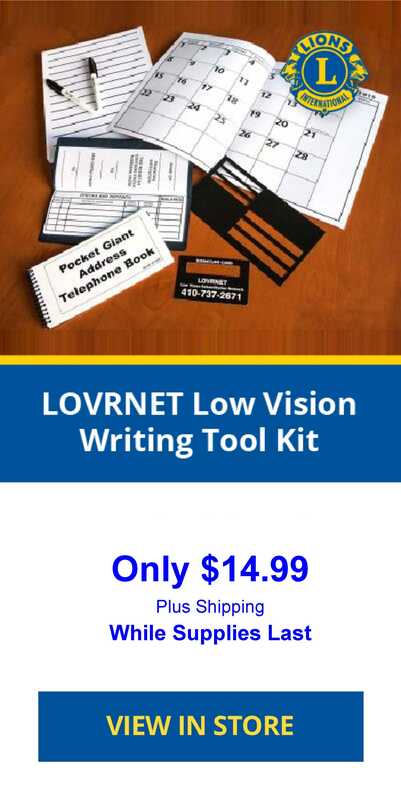 LOVRNET has packaged many of these tools into a Low Vision Writing Tool Kit. Reading can be made easier with a reading stand, especially when using magnifiers. • Recreation and Leisure: There are large print recreation and leisure products including board games, playing cards, bingo cards, crossword puzzles, and word search puzzles. There also is a selection of needle threaders and self-threading needles for sewing. People with low vision are strongly advised not to purchase magnifying devices until they have had a low vision evaluation. There are hundreds of choices of head-worn, handheld, and stand-mounted magnifiers and telescopes, both optical and electronic. It is very important to choose the correct power to match your vision and to meet the requirements of the task you want to perform with the device. Although not complicated, some amount of instruction is necessary in order to learn how to control viewing distance and focus, as well as auxiliary lighting and contrast enhancing options with different devices. Magnifiers, loupes, and telescopes sold in stores to the general public are not designed for low vision use and frequently are not powerful enough to be helpful. Often, to be effective, low vision magnifiers and telescopes have to be used in combination with prescription glasses. So, visiting an eye doctor specializing in low vision before buying magnifiers and telescopes will help avoid frustration and avoid wasting money on products that do not help.